Last night I finished the black socks! I am so happy to have these finished, I cannot even express my happiness on the blog! 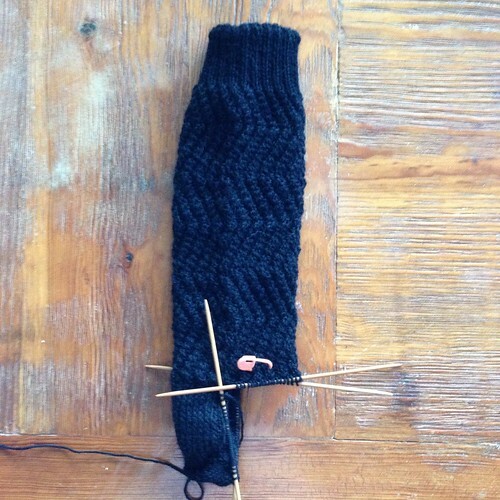 This is the one and only pair of black socks I will ever knit. They are Mickael’s. He will wear them, which is the only reason I finished them. The pattern is Go With The Flow, which is an easy pattern, and I think it’s unisex so it works for anyone’s sock, depending on the yarn color. It’s also based on ribbing, so the socks are super stretchy and if you’re knitting socks for a gift and can’t try things on, these should work out just fine as long your sizing is somewhere in the ballpark of their actual feet. What you might not have noticed, is that the socks start with a zig on one sock and start with a zag on the other sock, so they are mirror images of each other. Whether or not it was crucial that I do this on black socks, I don’t know, but I did it. It’s also really hard to get pictures of texture on black socks - pretend it’s there, for me. There were two problems with these socks: the color and the yarn. The color was my fault, I picked it. I did eventually figure out that I shouldn’t knit these socks at night, even with a good light. The yarn however, I was not happy with. (Please understand that the next bit is completely my opinion. Some people may adore this yarn. That’s great if you do. I don’t. If you have used this yarn and like it, please tell me what you’ve used it for - I have most of a skien left.) I used Berroco Ultra Alpaca Fine. The Ultra Alpaca Fine has a different fiber blend than Ultra Alpaca (which I love) and Ultra Alpaca Light (which I’ve never tried, but will probably love as much as the worsted weight Ultra Alpaca). The Ultra Alpaca Fine is made for socks - they’ve added nylon to the alpaca and wool blend, and it has more twist. This is fine and a good idea in general, but in practice, this particular yarn just didn’t work. It splits like crazy and drove me nuts. 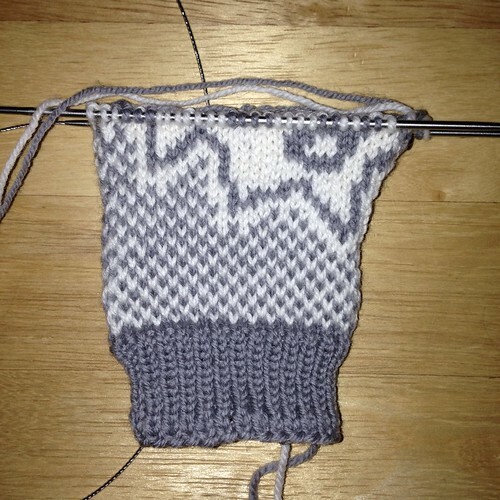 Once it’s knit, it feels fine, but it doesn’t have a lot of elasticity while knitting it, so I felt like I was constantly re-tensioning it on my hand. It took me most of the first sock to figure out what I didn’t like about it, or I would have switched yarns months ago. Now that they’re done, I think they’ll be great socks and wear well, but it was a battle getting the yarn knit into socks. One word done, one mitt almost done! We were supposed to have a Major Winter Weather Event this weekend - ice, snow, penguins, the whole deal. It kind of fizzled out though. There are tiny icicles hanging off of the bird feeder (less than two inches), and there are some icicles in the trees (so if you’re driving in North Texas this morning, stay out of the trees or you could completely lose control of your vehicle). I did cook a pot of chili and some Yankee cornbread (sweet cornbread), there was hot cocoa too. It was a good weekend, even if we didn’t get the storm. Blogging will probably be sporadic this week, since its Thanksgiving week and all! Stay warm wherever you are, and if you’re celebrating Thanksgiving this week, have a wonderful Thanksgiving! I got a last minute knitting request from Caleb, and while I explained that no, I could not make him another blanket in time for Christmas of this year (that kid seriously loves blankets), I could make him some fingerless mitts. He chose Fightin’ Words, and when I showed him the Loopy Ewe Solid Series color cards, he picked out his colors. He also suggested that I make some for Mickael too, so I got some sport weight yarn to make a second pair. I’m using my Heavy Metals and magic looping and it’s working really well. 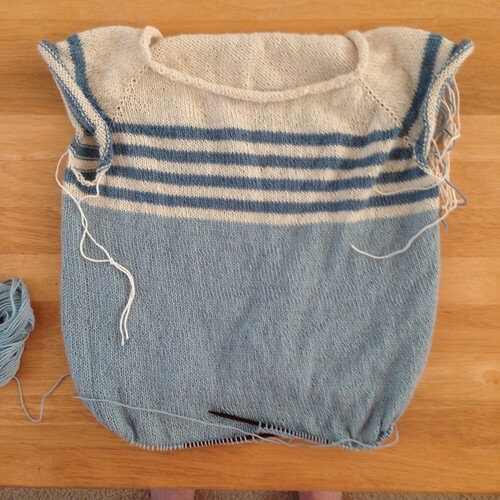 The practically non- existent joins and the perfect tips are wonderful to work with. I’m honestly wondering why they don’t make a set of double points in the Heavy Metals. 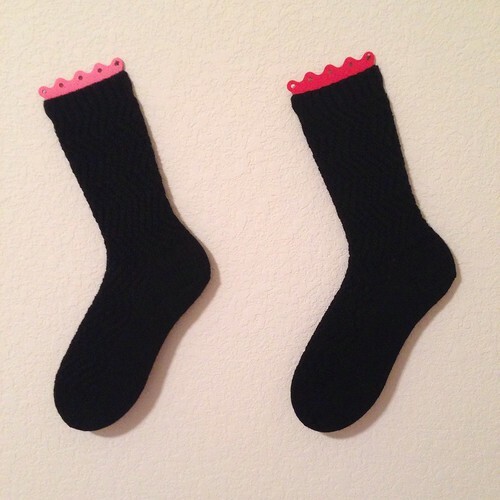 I’d love to knit socks with these! I started these yesterday afternoon after we finished school for the day and they’re zipping right along. I’m pretty happy with my tension on these. I don’t know if I’ve mentioned how I do stranded color work before, but I hold both yarns in my left hand. Some people work with a yarn in each hand, but holding them both in my left hand (I knit Continental) works really well for me. I’ve Rounded the Heel and I’m Headed For Home, Or The Toe! I think I can, I think I can, I think I can! 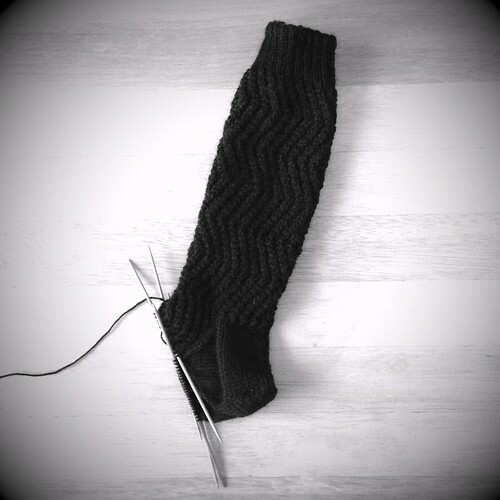 Slowly but surely, I’m getting this sock finished. That’s all I have to say about this. I'm past the stripes on the first sleeve and I've gotten far enough to try it on. Now I know how far I need to go to finish this sleeve. Over the weekend it occurred to me why I like this design so much. 3/4 sleeve tops are slimming because the sleeves end right about waist level. This draws the eye to the waist, which on most of us is one of the smaller bits of our body. Unfortunately, 3/4 sleeve tops aren't as warm as long sleeve tops, because your lower arm is hanging out. This design has long sleeves, so you stay warm, but the stripes end where a 3/4 length sleeve would end, drawing the eye to the waist, and being slimming! So it's flattering and you stay warm - win, win! Also, the design has stripes and I'm a little obsessed with stripes at the moment (you might have noticed). I’m running a flash sale to make your holiday knitting easier! From 8:30 AM November 15 (now) until midnight tomorrow night (November 16), all of my sock and mitt patterns will be 50% off! No code needed, the discount will show up in your cart automatically. There’s one little catch - it’s only through Ravelry purchases - not through blog purchases. Anyone can purchase through Ravelry, even if you’re not a Ravelry member, so it’s open to anyone! Here’s the Ravelry link to my patterns! Enjoy! 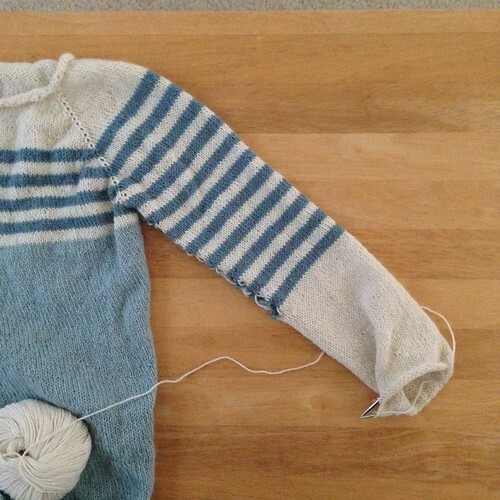 I’ve been striping happily along on my sweater! I started out working this sleeve using Magic Loop, and while it was working just fine, it wasn’t going as quickly as I like. Then I remembered that I have 9 inch circulars that I bought just for sleeves. (Sometimes I’m a little slow.) Once I switched over to that needle, the sleeve has been moving right along. It’s long enough now that I’m just twisting the sleeve itself as I knit around it, not the entire sweater, which is good because Max has been sitting in my lap under the sweater while I knit. He didn’t like it when I was moving the sweater on him. It’s too cold for the little kitty! On a completely unrelated note, I noticed something was up with the photos on the blog, but I think I fixed it. Leave a comment if you notice anything funny looking, would you? I know I need to clean up my sidebar and I’ll get to that, but I’m talking about enormous pictures and text overlapping other text, that kind of thing. I’ve done the heel flap and heel turn on the world’s slowest pair of socks! (It’s my fault they’re so slow, not the pattern’s.) I’ll be finishing these up in the next few weeks because Mickael’s birthday is coming up. All Summer and Fall I’ve been looking at my sock yarn stash, dreaming of starting another pair of socks (that isn’t black), but waiting until I finish knitting these. 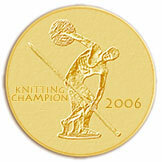 Of course, you all know the rule about finishing something - you actually have to knit on it to finish it. 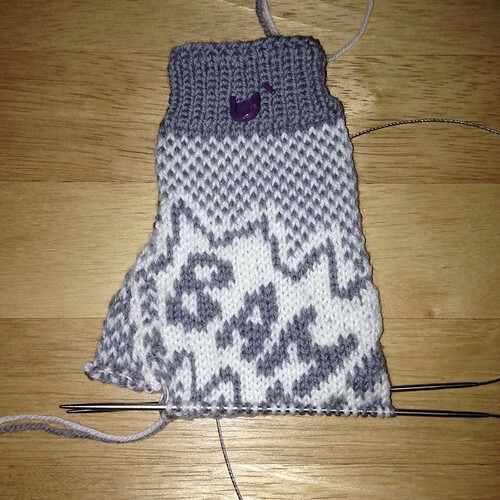 This is the second sock, and all I’ve got left is the foot. The biggest problem is that I should really only knit on them during the day. On the first sock I made tons of mistakes, that I then had to tink and correct. On the second sock, I tried knitting on it during the day and found I didn’t have anywhere near the errors. Part of this might be me understanding the pattern better, but the yarn is very splitty and at night, I couldn’t see when I’d split the yarn. I’ll only pull these out during the day, but my days are busier than they have been now since we started homeschooling Caleb. Hence, the world’s slowest pair of socks. I Found the Tape Measure! Not that it was that difficult, seeing as I have a tape measure collection, but I found one and decided to make it a sweater, not a dress. I also tried it on and it fits just like I wanted it to - not too tight, not too loose, just right. In addition to binding off the body, I also got all the ends woven in before I started my first sleeve. See? It was a productive weekend. The sleeves will have more stripes than the body and they’ll only be the darker color and ivory - none of the pale blue green will be on the sleeves. I think this pattern could be one I knit a lot of - it’s a classic shape, and did you notice the stripes? I could do all kinds of things with the stripes! I also tend to live in sweaters like this when it gets cold - I wear them like long sleeved t-shirts. 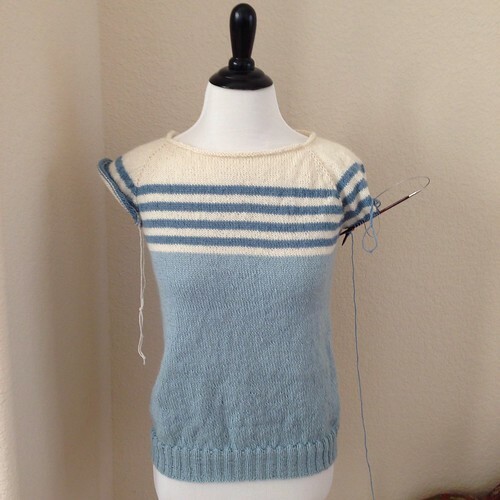 Of course I could also knit this shape without the stripes, but where would the fun be in that? 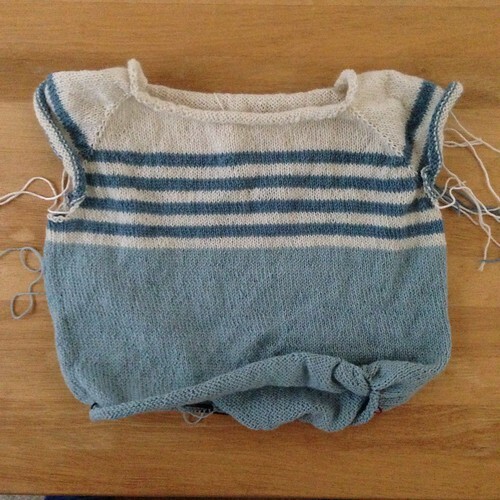 I’ve felt like knitting the last couple of days, and this simple, stockinette pullover is exactly the right project for me. No thinking, no counting, just knitting. 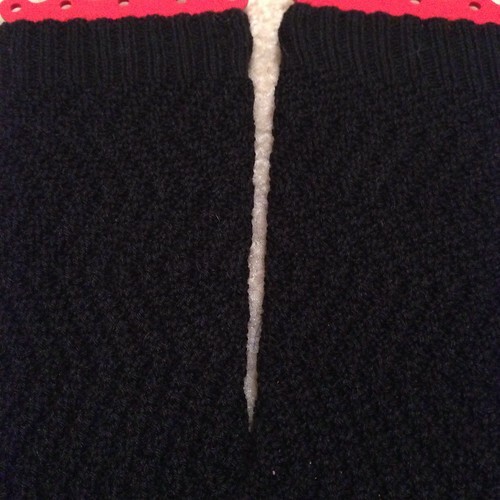 Knit 1, sneeze 1, repeat to the end of the round. Simple, right? Perfect for right now! If I’m feeling particularly ambitious, I might finish the body and start the sleeves over the weekend. Of course, then I’ll have to find a tape measure. If I don’t find a tape measure, I might make this a dress. Probably not. I’ll probably find the tape measure. I think there’s one in this project’s bag. Hopefully everything will return to normal next week (or at least what passes for normal around here). Last night, for the first time since I got sick, I had enough energy to knit. I’ve turned a corner and I’m going to live! I didn’t get enough knit to warrant a photo, but hopefully I’ll have something to show tomorrow. Thanks for all the tissue and supplement tips! I’d actually just learned about elderberry, but not from Dr. Oz, I learned about it on The Walking Dead. In other news, we had our first frost last night (and turned on the heat for the first time), so I will get to wear all these sweaters I’ve been knitting! 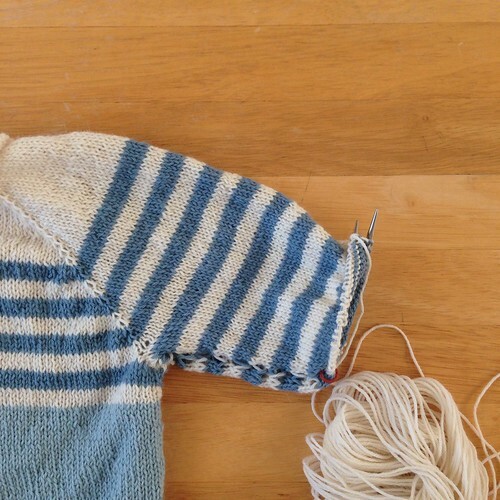 This past weekend, there was a lot of knitting on the body of my newest stripy sweater. There was also a lot of sniffling, sneezing, and coughing. We’ve all got a lovely virus around here, so the extra hour was welcomed by all (except Max and Logan who think they got dinner late last night). I’m off to the store today to get the kleenex with the lotion in it so no one’s nose falls off. Lots of Vitamin C and hot tea for me today!